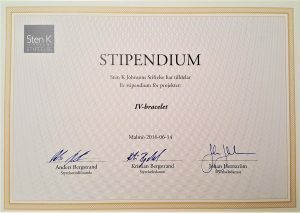 Medow is honored to receive a grant from Sten K Johnsons Stiftelse for the second time! A big thanks to the foundation for believing in us and IV-bracelet and for helping us get one step closer to launching the product. Medow was rewarded with a second place in the Brewhouse Award. Many thanks to Brewhouse for hosting the award and spectacular gala and thanks to the jury who believed in Medow and our product IV-bracelet! 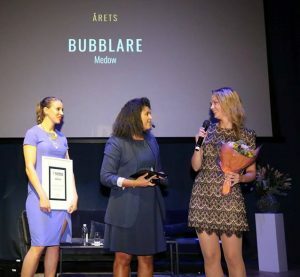 Medow competed in Business Challenge and after pitching our business idea in front of an impressive jury we were selected as the ”Bubblare” of the year! 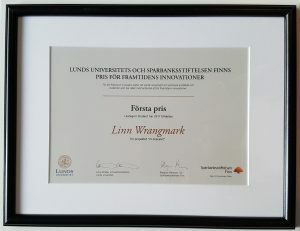 Medow participated in Businesspodden’s pitch competition and was chosen as the business of the week. If you want to listen to the podcast and Medow’s pitch click the link below! 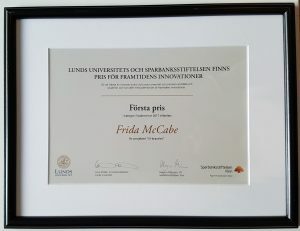 Medows founders Frida and Linn were one of the winners of Lund University and Sparbanksstiftelsen Finn’s prize Innovations of the future 2017. 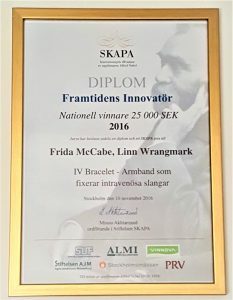 Medows founders Frida and Linn, with IV-bracelet, were in the national final of Innovator of the future 2016 awarded with a third place. 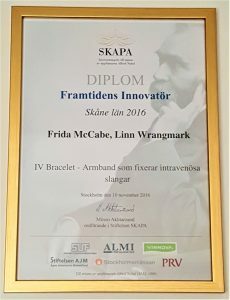 Medows founders Frida and Linn were, with IV-bracelet, selected as one of the two regional winners of the SKAPA foundation’s prize Innovator of the future2016. 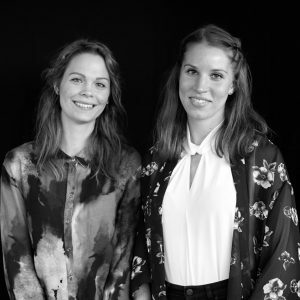 Both Medows founders Frida and Linn got a leapfrogs scholarship to work with IV-bracelet during the summer of 2016. 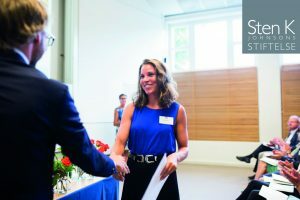 IV-bracelet was 2016 awarded with a grant from Sten K Johnsons Foundation in the category Entrepreneurship.